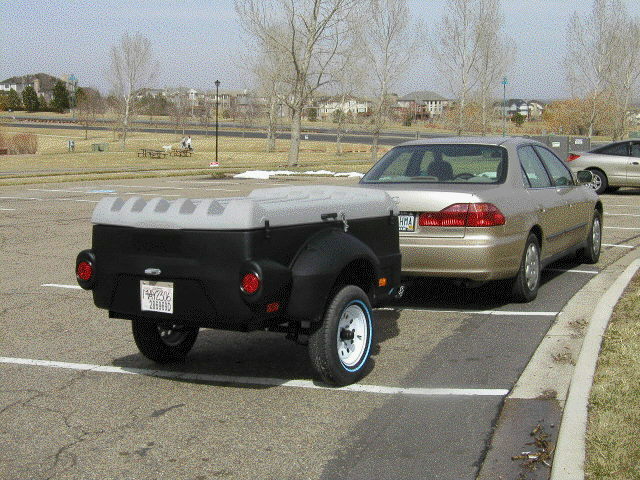 This versatile trailer, constructed out of roto molded polyethylene provides maximum towing capability with a rust proof body which will not dent or peel. SPACIOUS & VERSATILE The easiest way to transport luggage, sports equipment, camping gear and home improvement materials. The best all-purpose trailer on the market. WEATHERPROOF & LOCKABLE Safe, secure storage and transport of goods. AERODYNAMIC Less drag than roof mounted carrier systems or taller trailers - leads to better fuel efficiency. INNOVATIVE USE OF MATERIALS Strength and Durability. Low maintenance. Will not rust or rot. FRAME 3" X 2" Steel or aluminum tube. BODY AND REMOVABLE LID Extremely Tough and Durable, double walled roto-molded polyethylene construction. DIMENSIONS Box internal dimensions: 70" x 40" x 20". Overall: 116" x 62" x 37". * Please call us with any questions about our trailer cargo enclosed rentals in Burnsville MN, Rosemount MN, Apple Valley, Minneapolis, St Paul, Twin Cities, South Metro,and Dakota County.